Around the world, Ukrainian eggs are famous. The appeal? Well, for starters, they’re beautiful. Ukrainians have been mastering this art for centuries, resulting in gorgeous works that are nowadays displayed in museums. As any artist will tell you, working with small, intricate designs is no easy task, so the fact that Ukrainians have, for thousands of years, been able to create very elaborate designs on tiny, fragile surfaces is pretty astounding. Initially, these ovum artworks were created in celebration of spring’s approach but today their production is year-round due to high demand. Like many art forms native to a specific region, it’s evolved over the years, branching into many different methods. Krashanky are eggs that have been boiled and then dyed only a single hue. Today they’re often made with food coloring, but way back when, they got their coloration strictly from vegetable dyes. The most classic krashanka color is red and was created using onion skins. (Surprisingly, the colors they give off are really vibrant. Try it.) Of all the different traditional Ukrainian eggs, krashanky are the only ones that are meant to be eaten. 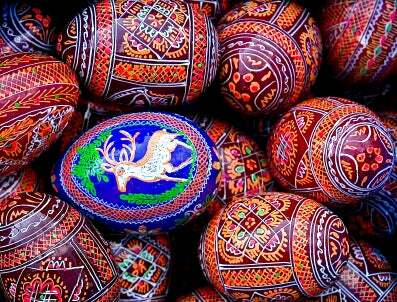 Dryapanky eggs are made by taking krashanka and scratching into the dye, exposing the egg’s shell once again, creating often elaborate designs. Lystovanky are also dyed a single color but are decorated with patterns made by fastening small leaves to the shell. After dyeing them, the leaves are removed, leaving silhouettes of their shapes on the egg. Pysanky are made with the wax-resist method, called batik. (If you’ve ever seen eggs that are labeled “Ukranian style,” you’re probably looking at these.) A special took called a kitska is used to apply the wax to the shell’s surface before it’s submerged in a dye. Generally, this process is repeated many times to create extraordinarily ornate designs. Krapanky are decorated with dots – and only dots. Similar to pysanky, krpanky are created using a wax-resist method too, but the wax is only applied in circular patterns on the shell. Nakleyanky are decorated by gluing small objects to an egg’s surface. Anything goes from yarn, beads, buttons, glitter, or feathers, which are artistically arranged to create patterns.